Pumpkin Pattern - for Halloween fun! In the spirit of Halloween, here's a pumpkin pattern to make you smile. These cuties are worked from this same pattern, just in different yarnsand hook sizes. The tiny one on the left is worked in cotton crochet thread size #10, with 1.65mm/7 hook. He works out to be 1 inch talland 1.25 inches wide. 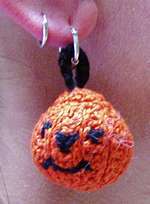 He looks great as a pendant or earrings if youprefer a subtle Halloween look. You can see these pictures further down the page. 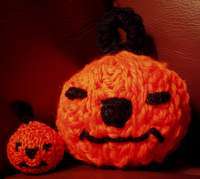 The larger pumpkin pattern on the right is worked in worsted weight yarn anda size I/9 5.5mm hook. He works out to be 2.5 inches tall and 2.75 inches wide. He's great as a stand alone decoration or childs toy. 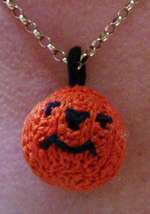 This pumpkin pattern is a quick and easy project, which can be workedin any weight of yarn. The thicker the yarn/larger the hook, the largerthe finished product. It may only take you a half hour to complete your own little pumpkin. Now, let's get going. You'll need to know... chain, single crochet, half double crochet, double crochet and slip stitch. You'll also need to know how to double crochetseveral stitches together. You'll find that explanation below the abbreviations. Yo, hook into first stitch, yo, pull through to front, yo, pull hook through 2 loops only (2 loops left on hook), *yo again, hook into next stitch, yo, pull through to front, yo,pull hook through 2 loops only *(3 loops left on hook), rep from *to * until you have 6 loops left on hook, then yo, pull hook through all remaining loops. Ch4, join with sl st to form loop, ch2, 9dc into loop, joinwith sl st to ch2 (forms base of pumpkin). Ch10, hdc into 3rd ch from hook and each of next 7ch, join with sl st to next st of base. Turn, working into the bar across each hdc ONLY, which is directly below where you would usually insert your hook sc in first st,hdc, 5dc, hdc, sc, ch1, turn. Working into the back loop of each st ONLY, hdc into each st, join with sl st to next st of base, turn. Rows 3 and 4 form the pattern repeat. Repeat these rows untilyou have worked a total of 20 rows around the pumpkin and have workedright around base, ending with a row 3. You will be at the top of the pumpkin, so join with sl st to end of first row. To form top - ch2, working into end of every second row, dc5togtwice, sl st to ch2, leave end of yarn to stitch down side of pumpkin, break yarn. Push stuffing into hole down open side of pumpkin, stitch down open edge,finish off end. Using black yarn/thread stitch on face as desired. Join black yarnto top of pumpkin, ch8, slip st to top to form loop, work sc around loop to finish off. Break yarn, weave in ends. There you have your pumpkin pattern - now ain't he cute? I think he looks great as earrings or a pendant. I thought I'd workhim in a thicker yarn too, so you could see how cute he is in alarger size. Make a few characters from this pumpkin pattern and hang them around your windows for when those 'trick or treaters'come calling. Hang a few on a garland, then switch them out as the seasons change. You know - you could also work this pattern in other colors to makeChristmas tree ornaments, or other seasonal earrings/pendants. Stitchon some sequins for some added sparkle. Such a versatile pumpkin pattern - you could use these little 'ball' shapes instead of pom poms on a childs hat or on the ends of a scarf,even around the bottom of a poncho. So many ideas - will you try them all? If you do - contact me - and I'll see about forming a gallery of projects made by my visitors! Wouldn't it be fun to see what others have made from these patterns? What are you waiting for? Happy Crocheting! How about trying a felted purse now? A beautiful octagon baby afghan pattern awaits you!